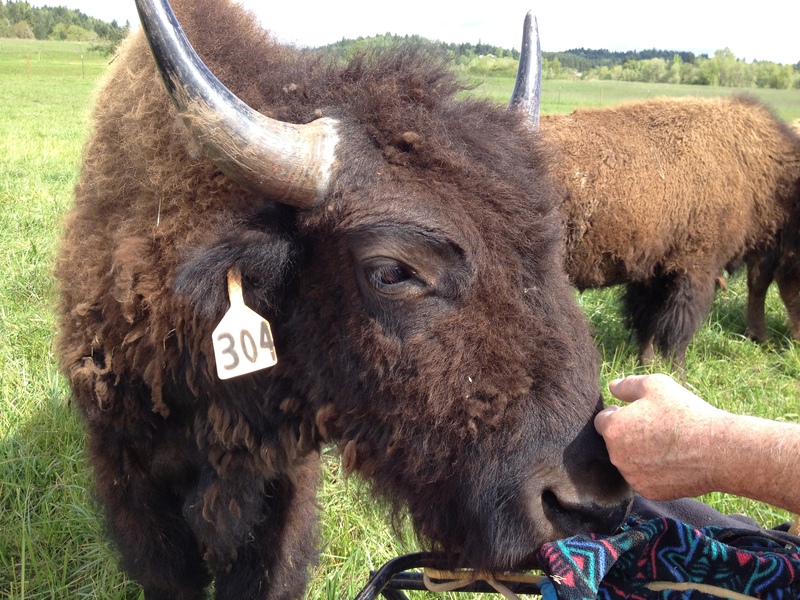 Welcome to Green Fields Bison Ranch! Green Fields Bison Ranch is a grass-fed bison ranch nestled in the Willamette Valley on the edge of the coastal range in Oregon, a half hour west of Salem. We enjoy our lives here in this beautiful valley where each day brings new adventures raising our bison. We value our animals and work hard to raise them humanely and naturally. They are amazing creatures. At the end of the day when the work is done, we enjoy going out into the pastures and sitting among them, listening to them as they graze the green fields. We “come into the peace of wild things” as Wendell Berry says in his poem, “The Peace of Wild Things”. Our goal is to raise the bison with a low stress handling approach. We work with their instincts instead of working against them. We practice patience when moving them to a new pasture by opening a gate and allowing them to move through it when they are ready to do so. We feel it is a privilege to be raising these iconic and majestic creatures. We sell our bison meat direct from the ranch all year long. If you would like to purchase our grass fed and finished bison meat by coming to the ranch, please contact us at lhedlund@gmail.com or call us at (971) 720-0462. We can set up an appointment for you to visit the ranch to buy meat. We will no longer be selling our bison meat at the 2019 Corvallis Indoor Winter Market this year. Come see us at the downtown Corvallis Farmer’s Market on April 20th. We are selling our grass fed and grass finished bison meat at the Salem Saturday Farmer’s Market beginning on the opening day of 2019 market on April 6th. Normally, we sell our bison meat on the 1st and 3rd Saturdays of each month at the Salem Saturday FM. However, in April we will be there on April 6th and 13th. Here are the remaining dates we will be in Salem: May 4th and 18th; June 1st, 15th, and 29th; July 6th and 20th; August 3rd, 17th, and 31st; September 7th and 21st; and October 5th and 26th. The Salem Saturday FM is located north of Marion St., between Winter and Summer Street. Our booth is on the east side of the market, just off of Summer Street. 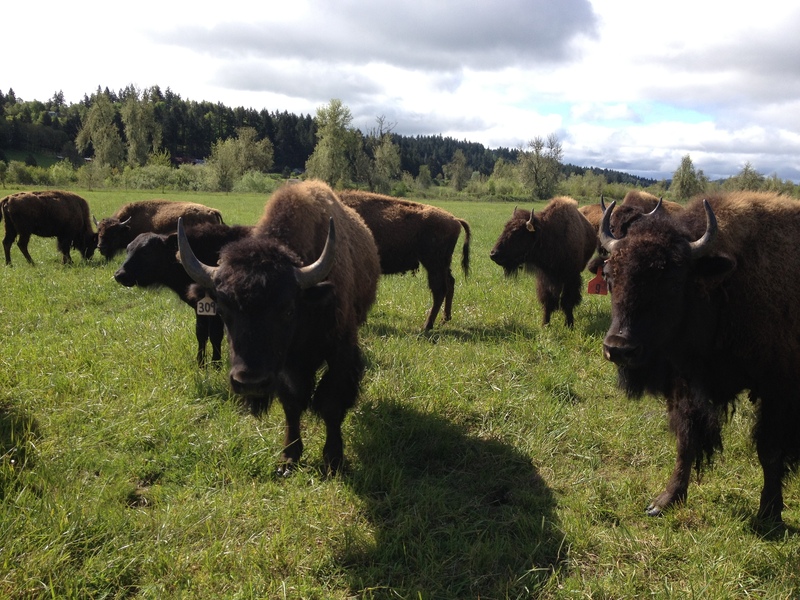 We look forward to selling you our locally raised, wildly nutritious bison meat! 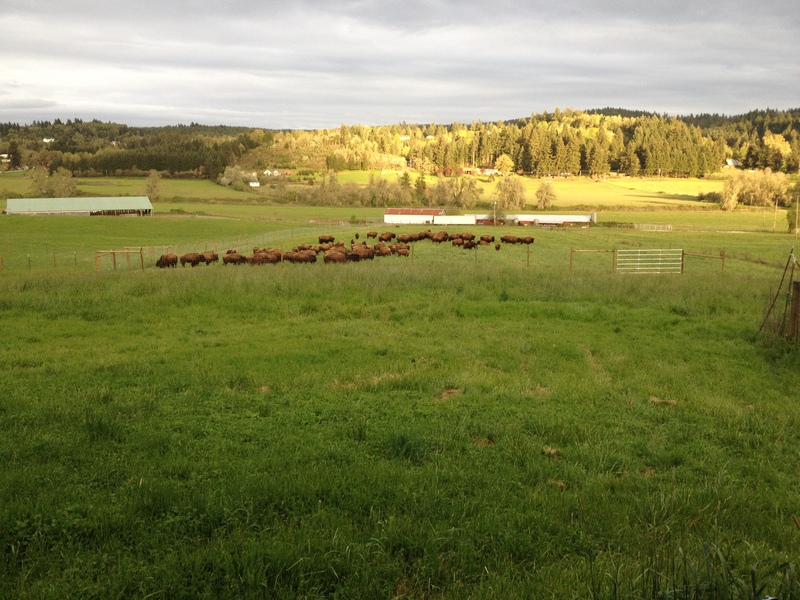 We will be selling our grass fed and grass finished bison meat at the Corvallis Saturday Farmer’s Market. The Corvallis downtown farmer’s market is at 1st Street and Jackson Avenue and also on Monroe Avenue. We will be at the Corvallis FM every second Saturday in 2019 starting in May and four Saturdays in November. Our dates are as follows: April 20th, May 11th, June 8th, July 13th, August 10th, September 14th, October 12th, and November 2nd, 9th, 16th and 23rd. Beautiful ranch! Love to find out when you are shipping to the east coast. Met you both at the (Salem) Saturday Market and purchased a heart and liver! Both were fantastic! Can’t wait to make another purchase. My kitchen staff and I enjoyed the meat from the hindquarter of a half bison I purchased from you and we were blown away — delicious. The quality of your bison meat is top notch. I cooked some of the bison meat this weekend that I ordered from you and it is by far the best tasting thing I have ever had. You guys really have a great thing going! Thank you so much and I can’t wait to order some more! Wonderful flavor and texture. Having had some grass-fed beef from a small farm in my area and found it tough, gamey and chewy, I wasn’t sure if that was expected. The answer is a resounding no, thankfully! This was amazing meat and we will absolutely order more. Lovely ranch and very friendly owners as well. We’ve tasted a range of the bison meat from Green Fields Bison Ranch. It’s easy to tell from both sight and taste that the bison is of the highest quality and that the grass fed animals have been treated well. The tasty breakfast sausage is nicely spiced, the ground bison is delicious in all kinds of recipes, and the steaks are absolutely first class. I have also slow cooked the chuck roast with onions, and it’s the best dish I’ve ever made. Was out to your ranch last Saturday with my mom, tonight we had the flat iron steaks and they were incredible! Great flavor and very tender they were. Will definitely be back to restock the freezer!! !